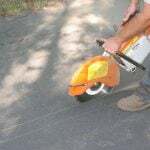 Fall asphalt repair and maintenance is very important to allow for appropriate preparation for winter and ensure protection of your asphalt. 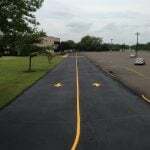 Before winter, it is important to inspect your parking lot and make any necessary asphalt repairs like crack filling, pothole patching, sealcoating, line striping, drainage checks, etc. As part of your fall asphalt repair plan, you’ll need to make sure that all cracks in your lot are filled. Fall is actually the best time of year for crack filling services. By using hot rubberized crack filler, you are not only sealing the crack but you are allowing for flexibility and movement. Since rubber is flexible, its ability to move is extremely important in winter, due to expanding and contracting caused by the freeze-thaw cycle. Filling cracks in asphalt helps to avoid water penetration to the base, which could be detrimental to your asphalt structure. It’s very important that this is completed before winter, because snow accumulation throughout winter means increased moisture exposure. Crack filling should be completed BEFORE applying asphalt sealer. Help to avoid asphalt cracking by putting together a regular yearly maintenance schedule for your parking lot. Patching potholes in fall is also very important for the same reasons as crack filling is. It is very common for potholes to form in winter for several reasons. So, going into winter with existing potholes is a recipe for disaster, and significantly increasing the amount of asphalt repair that will be needed after winter. A pothole(s) left untreated can lead to complete pavement deterioration. There are three basic pothole patching methods – Saw cut & patch, milling & patching, and infra-red patching. Learn more about these methods HERE. There are also some temporary pavement repair methods to complete during winter to get you through to the spring season. Here are some areas of pavement that are most susceptible to potholes. 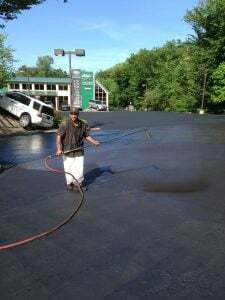 Asphalt sealer is great for several reasons including, protection, aesthetic appeal, and preservation of your asphalt – helping to drop the natural deterioration rate. When combined in conjunction with crack filler, it helps to provide a protective layer, which is especially important going into the harsh winter months. Sealcoating can typically be applied to asphalt well into October – temperatures will just need to be closely monitored. The best time of year for sealcoating is summer. 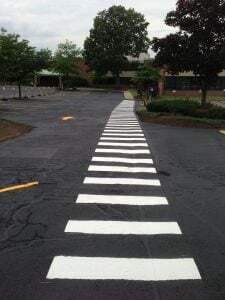 If you are sealing your lot, line striping is a must after sealer application. 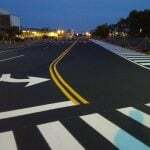 But additionally, line striping is important for several reasons, including vital ADA regulations and standards. 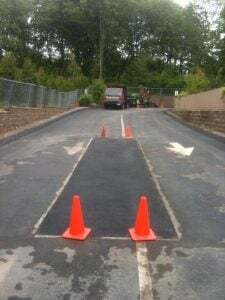 But, it also ensures safety through the winter months for better visibility (painted lines, arrow, traffic indicators, speed bumps, stop bars, crosswalks, etc. Did you know that in 2017, CT passed into law Public Act 16-78 to replace the international symbol of accessibility with a new, modernized symbol. It is important that your paving contractor is well-versed in up-to-date ADA regulations to avoid fines, lawsuits, and wasted money. In winter, water damage risks are much higher due to snow and ice buildup. With extended exposure to snow piles, once these piles melt, the water needs an effective and efficient place to go. A correct drainage system ensures that this is the case, and avoids excessive pooling and puddling that could damage your asphalt. These pooling areas can also lead to slip-and-fall damages in winter when frozen. 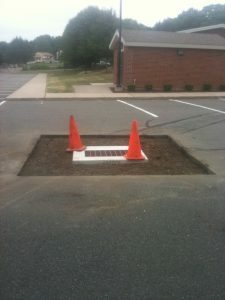 Your catch basins should also be inspected during fall asphalt repair. Salt & Deicers – While deicers do not technically deteriorate your asphalt on their own, they can contribute to making potholes and other asphalt issues worse by keeping water in liquid form at lower temperatures. This allows for the freeze-thaw cycle to occur at varying temperatures. Snow Removal – Any scraping against your pavement with heavy machinery can unfortunately cause damages. Most damages associated with snow removal will occur on curbing, and uneven areas of the surface. Water – Water is one of the most damaging elements to asphalt, and in winter, there is more of it. The extended periods of time that your asphalt will be exposed to water buildup (snow piles) mixed with other harsh winter elements (salt, snow removal, and expanding and contracting) will leave you asphalt more vulnerable to damages that require will repair in spring. 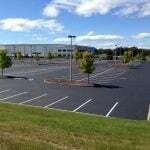 Unfortunately, it is pretty much guaranteed that your parking lot will need asphalt repair following winter. But, the amount of repair needed will vary based on the state of the pavement going into winter. If fall asphalt repair is ignored, the damage over winter will be much worse than a properly prepared lot. Get your complete step-by-step winter preparation guide and checklist HERE. Now is the time to fully prepare your parking lot for winter. Make sure to repair and prepare you lot now, before our first snowfall! 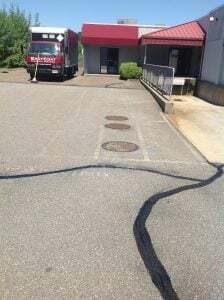 Contact EastCoat Pavement Services for your free fall asphalt repair consultation!